Architecture; built to exacting standards. Uniquely we are chartered architects, construction managers and (NHBC-registered) builders; all seamlessly combined within one practice. From listed country cottages to bespoke new-builds, plusminuszero has the expertise, experience and dedication to ensure quality, craftsmanship and the highest standards. And at the core of its success is a commitment to maintaining long-standing relationships with its clients. plusminuszero employs a small dedicated workforce of apprentice-trained craftsmen. Traditional skills are expertly delivered by these teams working closely with specialist works contractors (or subcontractors) with whom we have long-standing relationships. CGI of new detached villa designed to meet the PassivHaus energy performance standard. plusminuszero approaches each project as a partnership, with the client and designer sharing the same common values and with a total commitment to the highest quality. What distinguishes plusminuszero is the professional management of all stages of the contract by a highly qualified management team. And we undertake not just to ensure that the building is finished to the highest possible standards but that it can be easily and properly maintained thereafter. 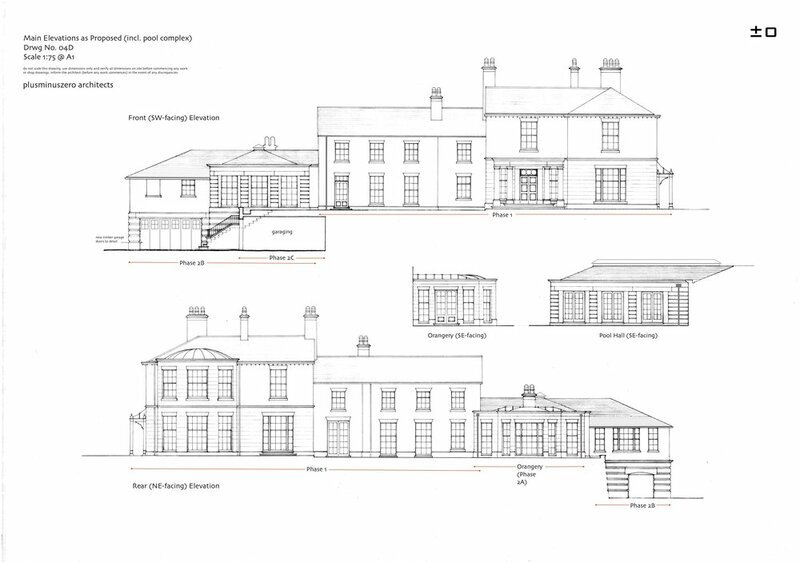 Planning drawings for the re-modelling and refurbishment of a Grade II listed hall. Completion is scheduled for late 2017.